Entrance level Robot is flexible and extensible for nova, while high level such as 21DOF robot adopts the orthogonal axis so as to make it more like a human being than some other robots in the market. (Video: Walk Step&Turn Lie down & Get up Dance Standup) Sample data ＆ Assembly Video are available. Gyro Sensor & Bluetooth or PS2 Gamepad New Remote Control Experiment click title to watch the video. orthogonal axis structure makes it simple to use inverse kinematics theory for motion planning. click to watch the video. 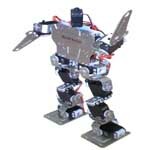 In terms of various parts, Biped or Multi-leg Robot can be assembled according to your own will. Square connection parts is available for link and fix standard RC servo in many direction. Metal horn and metal bush front case accessories can form a rigid Robot. U-type bracket is used in many cases such as arm, leg etc. what is the next opportunity?